Anyone visiting the BBC’s homepage today will be in for a bit of a shock, with the familiar interface being completely transformed, courtesy of a hefty, tablet-friendly makeover. The beta provides a first glimpse of core design principles that will underpin the reshaped BBC Online, which take into account changing user behaviours including the preference for ‘swiping’ through content – increasingly intuitive given the rise of touch-screen smart phones and tablets. Looking like it’s now been designed for an iPad rather than a desktop, the new homepage design is now very graphic heavy, with only a short text description accompanying each story. 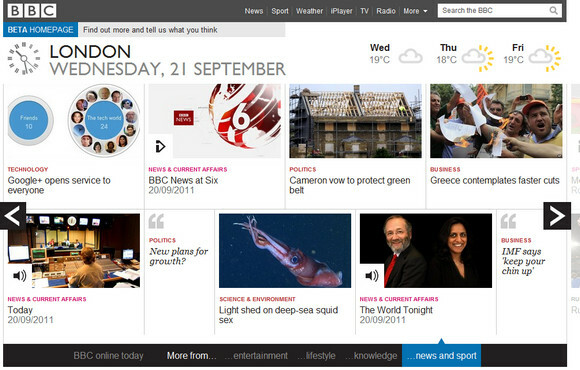 The BBC last changed its homepage design back in 2008, although Phil Fearnley, General Manager of News & Knowledge, BBC Future Media commented that the corporation has been making progressive improvements to the BBC homepage since it launched in 1997. 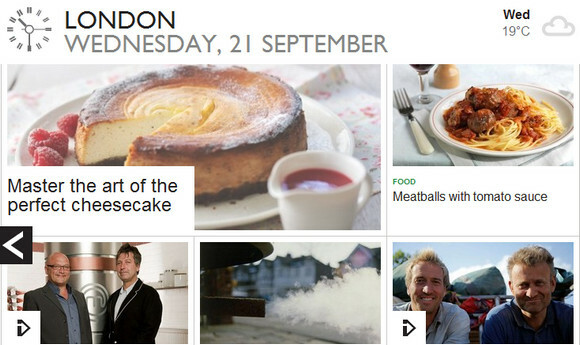 “The BBC homepage attracts over 9 million unique browsers a week across devices and the new page is designed to meet the challenge of serving this mass audience by showcasing the breadth of what we create on the web, whilst enabling the simple filtering which users have come to expect. We’re still not sure what to make of this design overhaul. Maybe we’ll grow to love it. But perhaps the question to be asked is: should a BBC website really look and act like it’s been designed for an iPad when so many of its users will be accessing it through laptops and desktops? It’s a great re-design and not specifically for iPad – all tablets / handhelds are ‘swipe’ enabled and stats show that less and less people ‘consume’ the web through the traditional means of a desktop PC, and more and more through mobile hardware, such as tablets and smartphones. This is a trend which will only grow. 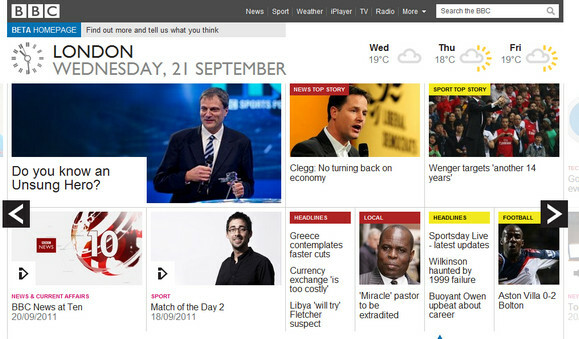 Just as importantly, the new BBC site is ready for Windows8 which will be released soon – it’s a massive overhaul of an OS with ‘swipe’ being one of its main components. Suprisingly though it’s not written in HTML5 as far as I can see – so their ahead on one level and not on others.